62% of B2B companies use webinars, according to “B2B Content Marketing: 2015 Benchmarks, Budgets and Trends — North America.” The report also says that 64% of respondents have indicated that the webinar is one of the more effective tactics, second behind in-person events. A well-planned, educational webinar won’t accomplish much without attendees. Companies that excel with webinars create an integrated marketing strategy that ensures they promote their webinar using multiple tactics. One of those tactics is LinkedIn. A client contacted me asking how to promote his company’s upcoming webinar on LinkedIn. I’m also planning several LinkedIn webinars, which prompted me to create this checklist for promoting a webinar using LinkedIn. 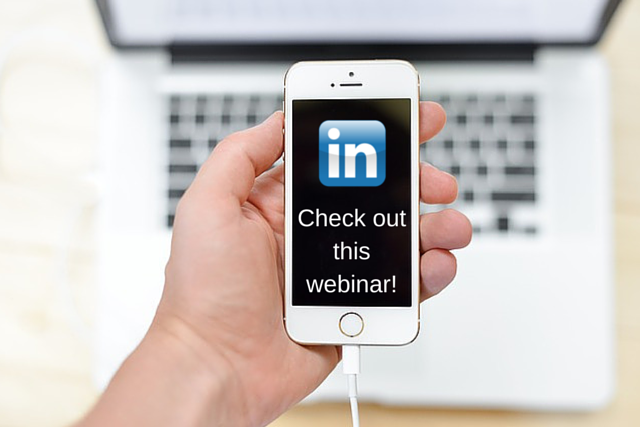 You can spread the word about your webinar on LinkedIn with these six steps. Do this as soon as you have your webinar topic and target audience in mind. Many high-quality LinkedIn Groups require the Group owner’s approval. Approvals don’t always come as quickly as you would like. You may already belong to some Groups. However, my client’s webinar covered a more narrow audience than his typical one. Before asking to join a group, make sure it’s OK for someone in your role and company to join the group. For example, many LinkedIn Groups exist for managed services providers. Some say they’re only for MSP practitioners. This means they might not approve of membership for someone who works for a marketing company with plans for a webinar targeting MSPs. Publishing a blog post on LinkedIn can provide your webinar with a search engine boost and help you reach your target audience, especially when you combine it with LinkedIn content ads. (More on that shortly.) Publishing a post in your company’s blog also works. When you create a blog post that offers valuable information, it gives you an excuse to share it without looking like you are promoting your company. Since the blog post covers the webinar’s topic, people who want to know more will want to sign up for it. Be sure to include information about your webinar at the end of the post with a link for registering. If you’re recording the webinar, encourage people to sign up even if they can’t attend as they’ll receive the recording and other goodies. Also check the Group’s focus. Using the MSP example, some Groups limit discussions to the core business. In other words, they don’t want posts about helping managed services providers with their social media or search engine marketing. This information ensures you respect the Group’s rules and increases your chances of seeing your webinar post safely published. Since webinar promotions tend to be self-serving, owners sometimes delete them. This brings us to the next step. It’s not unusual for people to join a LinkedIn Group to promote a webinar or another event, and nothing else. With LinkedIn’s 50 Group membership limit, people would join a Group, post the webinar and then leave the Group. This can burn bridges and make it harder for your webinar post to stick. To improve stickiness, share links to resources that are valuable to the Group that don’t come from your website. Be sure to include a brief introduction to show you put thought into it. Whether or not you join the Group, you can contact Group owners to see if their group would be interested in the webinar. This message would need to demonstrate the webinar’s benefits to their members. If you make the effort to contact the Group owner rather than promoting it in the Group, you might win a few brownie points. The other reason for contacting owners is that it may not be appropriate to post the webinar in the Group. If the owner deems the webinar as useful, he or she may send a message to the Group telling them about it. When the post or message comes from the owner, it’s more likely to be trusted and read. LinkedIn allows you to post sponsored content as ads that can be precisely tailored to different segments and targeted by job function, seniority, industry, geography or company size, and industry followers. To see what these look like, sign into LinkedIn and browse the updates on your home page. The sponsored ads say “Sponsored” at the top of the update. To create a LinkedIn Content sponsored ad, you submit a link to the content and any assets to LinkedIn. LinkedIn creates the ad and sends you a preview for your approval. You can use the LinkedIn blog post as the content, your webinar landing page or both. What other ways have you used to promote your webinar on LinkedIn?